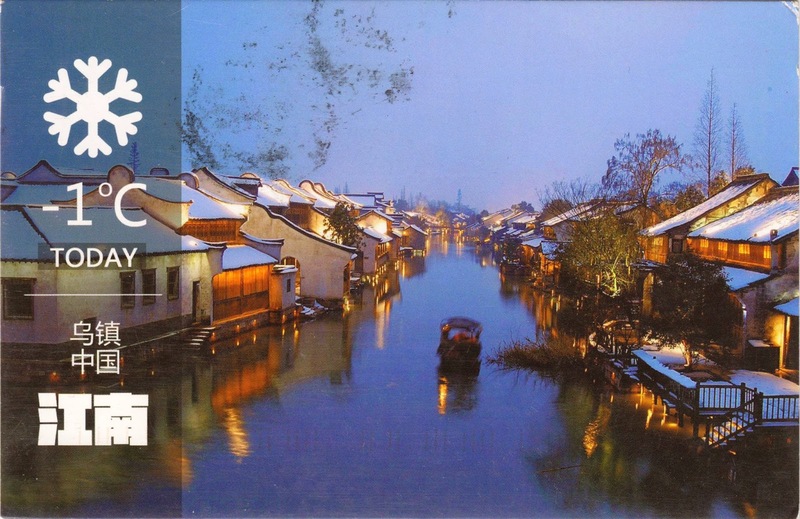 Postcard CN-1163302 from China shows a winter scene at Wuzhen (乌镇), a historic scenic town, in Tongxiang, northern Zhejiang Province, China. It is only lies 68 km south of Tongli, Wujiang county, Jiangsu Province, another historic scenic town that we featured before. Within the proximity of triangle formed by three major cities: Hangzhou (80 km), Suzhou (80 km) and Shanghai (140 km), Wuzhen is a small town that covers an area of 71.19 sq km or 27.49 sq mi, with a total population of 60,000, of which 12,000 permanent residents. Wuzhen is noted for its historic buildings, stone bridges, stone pathways and delicate wood carvings, mostly from Qing Dynasty (1644 - 1912).